This hands-on approach to learning science is not entirely new, but with new state science standards there is a lot more "doing" science and a lot less reading about science in textbooks. "We don't have books and worksheets any more," said fourth-grade teacher Sarah Keizer. "It's more hands on and allowing students to come to conclusions. It's very much more experimental. It's building and creating not just reading about science." Keizer said she loves teaching this way and loves seeing the kids being inquisitive and finding their way to answers. "Science is one of my favorite things, " said Sam Baxter as he moved around the elementary room stations. "I love the way it shows me science and doesn't just tell me," said Kella Leclaire. Cross-Cutting Concepts (conceptual ideas common to all areas of science). "The main goal is to promote classrooms that provide science learning that is full of model-based inquiry, evidence-based reasoning, and talk," said TK District Curriculum Director Kim Chausow. 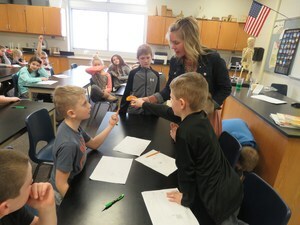 Middle school teacher Jamie Bowman had a broomball-type contest where seventh-graders learned about force and motion. "I feel like we are now doing science, rather than me teaching and my students learning science. My students no longer learn science from a textbook, but rather through one to three lab situations per week, as well as group collaboration," said Bowman. Another middle school science teacher agreed fully. "I like the fact that the trend is away from rote memorization. Instead, the emphasis is on asking questions, developing hypotheses, testing models, and making evidence-based arguments. 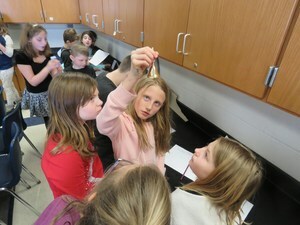 It has the kids doing a lot more science," said Shaun Davis. "Students will be challenged to think more and to be responsible for what they create. They also will learn that failure is not a terrible thing. Instead, it's an opportunity to learn and grow. Teachers will take on the role of guide/facilitator more than in the past," Davis said. High school advanced placement science courses underwent a philosophical change toward inquiry-based labs already and the new state standards have teachers creating those same types of opportunities for all students. "For the bulk of our students the new standards will offer students increased inquiry opportunities, with a new emphasis on process," said high school teacher Tim Penfield. He said content is still important but that creating students who can think critically to answer higher-level questions is the main goal. In a recent three-phase project in Penfield's advanced chemistry class, student groups worked collaboratively to produce their own gaseous hydrogen then test its effectiveness in propelling a plastic pop bottle. The first day proved some trial and error as tests proved the quantities made were far too little to propel the bottles. The second day was more successful as students perfected the production. The winning launch measured 20.3 meters down the science-wing hallway. The groups then had to consider the implications of their findings and respond to a question about whether the United States should continue research and development of hydrogen fuel cells as alternative energy sources. "Our lessons will reflect more and more inquiry opportunities. In addition, our lessons will continue to focus on collaborative opportunities with students communicating results to their peers in a meaningful manner," he said. This new science method isn't just new for the students, it's new for teachers as well. Teachers are currently involved in specialized training at the Van Andel Education Institute learning new ways of teaching through the inquiry process. The high school offers a variety of science classes including three advanced placement science courses and several advanced elective science classes including anatomy/physiology, genetics, biotechnology and zoology. By the very definition of the word "science", it's an active learning process. According to Webster's definition "Science is the intellectual and practical activity encompassing the systematic study of the structure and behavior of the physical and natural world through observation and experiment." 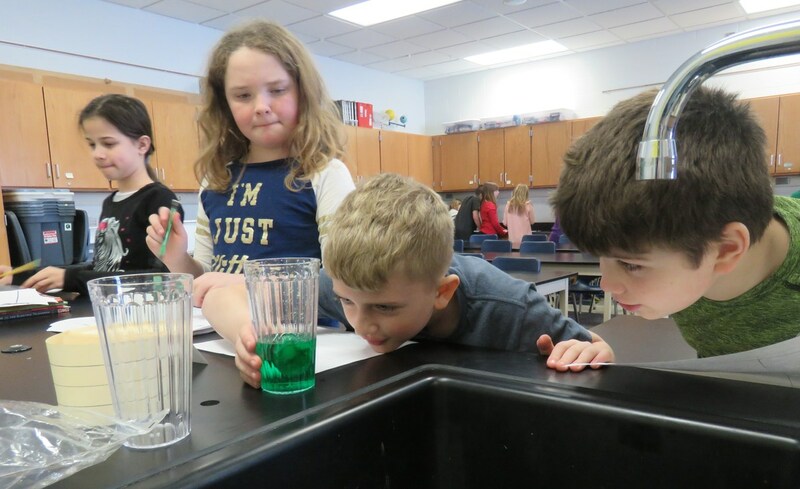 " The adoption of new standards provides a tremendous opportunity in our state not only to improve science learning but also to improve literacy and thinking skills of all children," said Chausow. It's a change taking place from the early elementary grades through advanced high school science classes. "The new science standards promote student engagement and inquiry. I like that students are experiencing science," said Chausow. 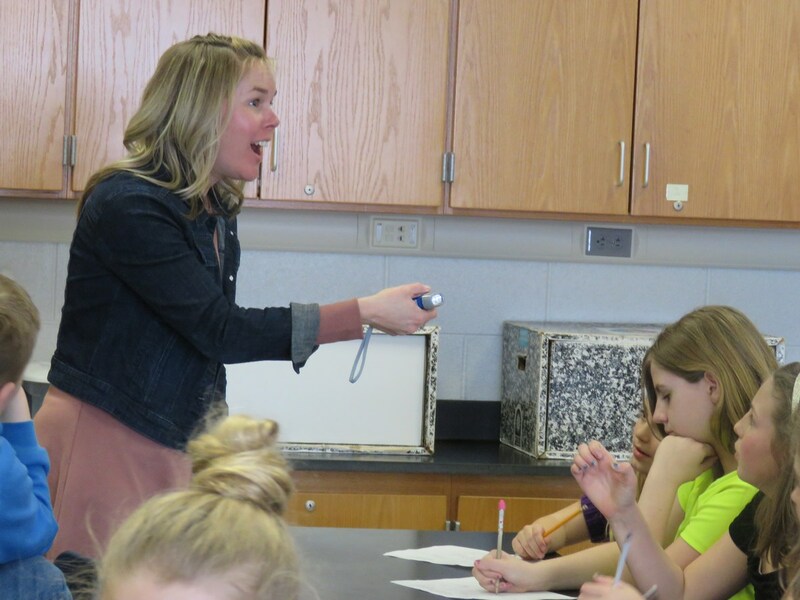 Back in the fourth-grade science lab, after students visited each of the "energy" stations, they discussed what types of energy were occurring. It took some thought, some processing information and even collaborating with others. But as they talked about what they observed, their own light bulbs went on and they understood the concept of energy being transferrable in different forms. "I wish we could do this every day," said Sam Baxter. "It's one of my favorite things now."